1. Lift the wiper arms off the windshield. 2. 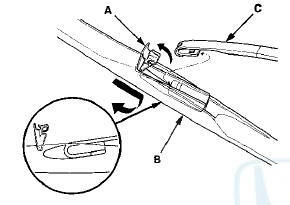 Pull up and hold the tab (A), and slide the wiper blade assembly (B) toward the tabs until it releases from the wiper arm (C). 3. Pull back the end of the blade and slide out the old blade (A). 1. Align the groove (A) of the each rail (B) and a new blade ( C ). 2. Install the new blade with the rails into the blade holder in the reverse order of removal. 3. 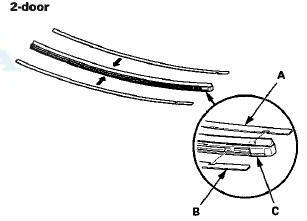 Install the wiper lade assemblies onto the wiper arms in the reverse order of removal . 4. Test the wipers by turning the wiper switch on , If the blades slip , turn the wipers witch off and seat the wiper blade securely.